Waking up the day after an awards show can be a little like coming out of a weird dream. Did they really do that? Taylor Swift danced with creepy bunny-headed circus types? Frank Ocean ran like Forrest Gump? Was that actually Prince? We tackled some of the unanswered questions still buzzing around our heads this Monday after the Grammy Awards. Prince's cane was stylish, but also practical. 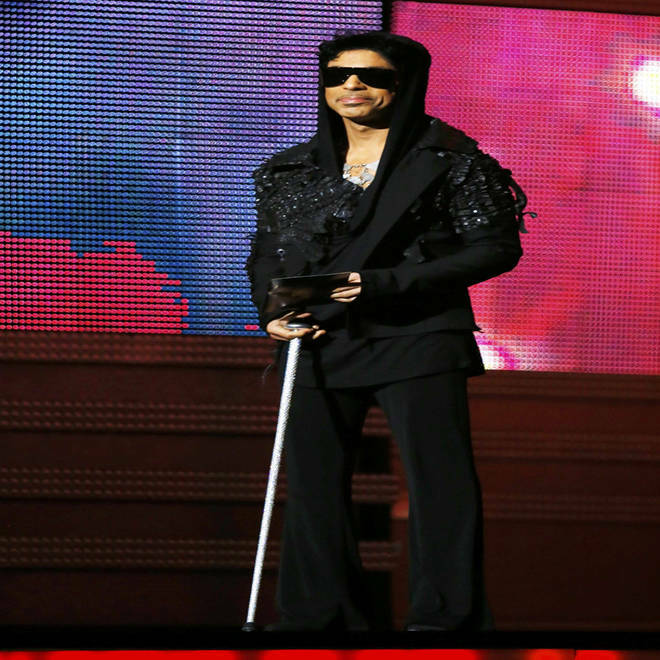 What was with Prince's cane? His Royal Badness stunned the audience when he strolled out to present the record of the year award to Gotye and Kimbra for "Somebody That I Used to Know" (and thrilled the singers when he casually announced, "I love this song"). But what was with the stylish cane he was toting? The reclusive musician won't say, but we know this: Prince has suffered hip problems for years and reportedly needs a double hip replacement (some say he's already had surgery on his hip in the past). As Prince is a Jehovah's Witness, blood transfusions are against his beliefs, but it is possible to perform such an operation using other procedures. Still, as the London Guardian pointed out back in 2009, canes have been a part of Prince's style closet since the 1990s -- this is not a new look. He sure didn't need it to walk, as was evident from his cool onstage strut. How did Carrie Underwood's image-changing dress work? Underwood told the Associated Press backstage that the dress was made out of a special material so that the image flashed on it would show up, and that she had to stand rooted to a certain spot on stage to make it work. "They can do a lot of amazing things with projectors these days," she said. "I said I should take that home and we can watch movies on it." The gown was created in three days and took 10 yards of Duchesse satin, 100 yards of tulle and crinoline and thousands of Swarovski crystals, and required an extra-wide skirt to make it work as a display screen, People reports. Butterflies and flowers danced across Carrie Underwood's dress. Is fun. really a new band? The band fun. won the Grammy for best new artist, and claimed song of the year for "We Are Young." But as frontman Nate Ruess pointed out in the band's acceptance speech, "we are not very young." They're not really a new artist, either, having been together since 2008. But this award is a weird one. Grammy rules say that the best new artist honor goes to "a new artist who releases, during the Eligibility Year, the first recording which establishes the public identity of that artist." That doesn't mean that recording has to be the band's first. In fact, Grammy rules now allow that you can even have been nominated for a Grammy in past years as long as you didn't win, and your nomination wasn't for an entire album. "New" is in the eye of the beholder, apparently. Did Jack White swear on-air? Did Mumford & Sons? Many Grammy-watchers heard Jack White sing what sounded like "F--- me" during his performance of "Love Interruption." CBS is denying it, claiming White said "fight me," though they're not going to convince everyone of that. Mumford & Sons was a different story, however. When the band won for album of the year, Marcus Mumford indicated Adele, who presented the award, and said, "We didn't win last year 'cause she was nominated for (expletive) everything." That remark was bleeped by CBS, which was running the show on a reported 10-second delay. Who was the man in feathers behind the Black Keys? That was music veteran Dr. John, wearing the same exotic headdress he sports on his new album. 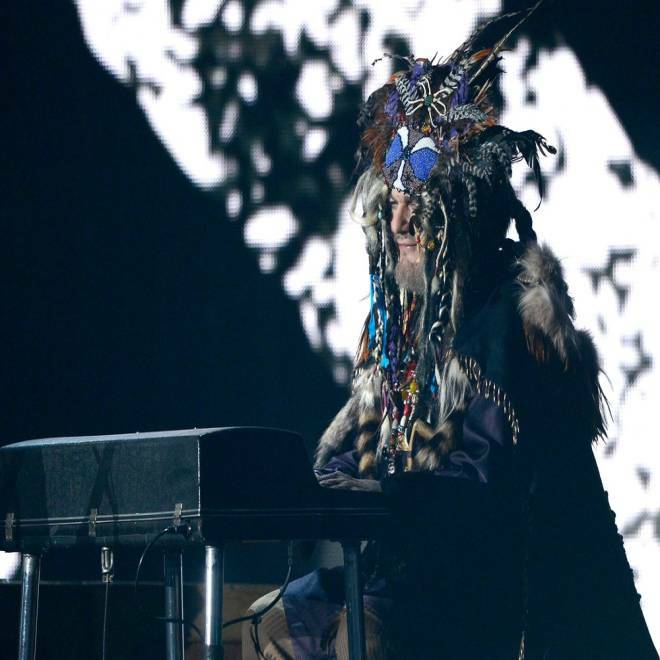 Dr. John's flamboyant headdress attracted attention when he performed with The Black Keys. Why was 'Girls' star Lena Dunham at the Grammys? Dunham has been dating fun. guitarist Jack Antonoff since last fall. She's reportedly asked to use songs from the band on her show, and he thanked her when the band won song of the year. Bieber wasn't nominated for anything, and he told Ellen Degeneres "I know it'll happen one day." Bieber had intended to livestream a video of himself during the awards show, but too many fans flooded the stream, apparently, so it failed. Instead he put up a two-minute video of some music in progress, complete with visits from his toddler brother and little sister.